In my last post, I had talked about the benefits of using a common directory structure for all your projects. Well here is another good one. I used to be opening up my command prompt and changing directories to the root directory of the project to launch my build scripts every time I needed to build. Opening up the command prompt to launch the build can get old on you pretty soon. But I was able to add a couple of buttons to my Visual Studio toolbar to launch my automated build and deploy scripts eliminating the need for the command prompt. 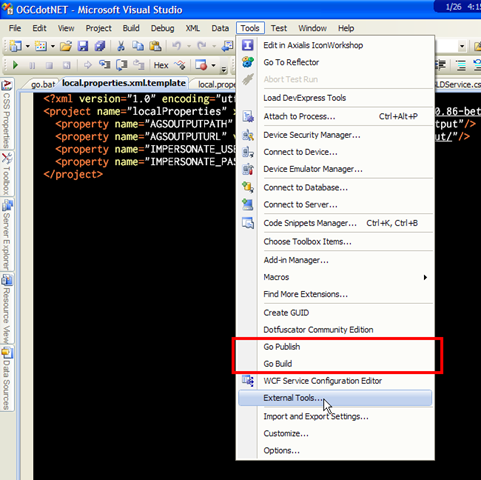 Adding commands to the Visual Studio toolbar is pretty easy and can be done as shown below. Go to the “Tools -> External Tools” item on the Visual Studio menu bar. So, I just need to launch the “Go.bat” file with the project root as the working directory with the right NAnt targets as arguments. Since, my “Go.bat” file and my Visual Studio solution file reside in the same directory (project root). I can setup my external commands as below. 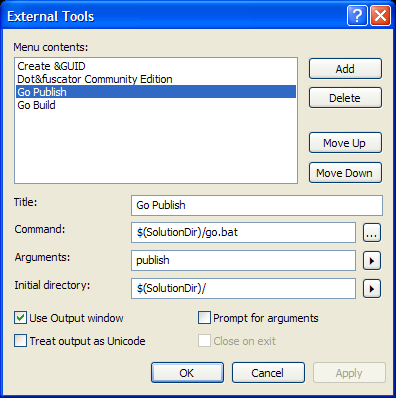 I can setup two external tools that invoke the “Go.bat” file with the working directory set to the path where the Visual Studio solution file ($(SolutionDir)/) resides. 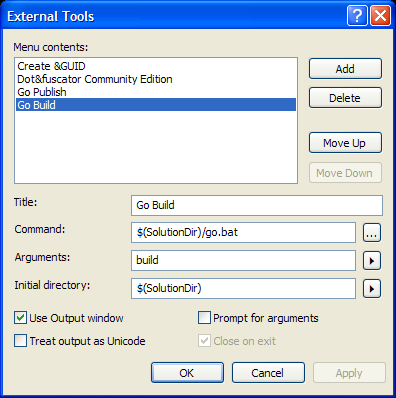 Note that I am passing in “build” and “publish” as the arguments to the “Go.bat” file when I launch it to either run the “build” NAnt target or run the “publish” NAnt target. 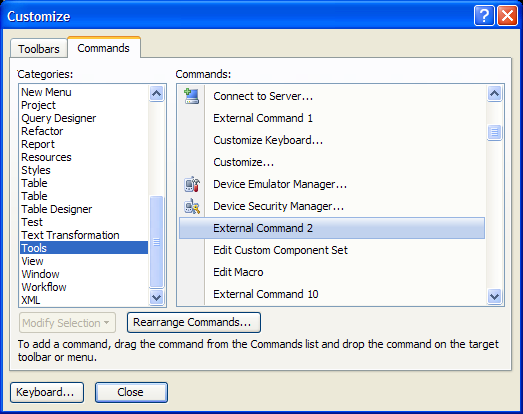 Once the two entries have been setup here, they will appear in the “Tools” menu options in Visual Studio. The last thing that is left to do is the trickiest part and I am not sure why Microsoft has left it this way. Go to “Tools -> Customize” and the dialog below should pop-up. Select “Tools” in the “Categories” list on the left. And this should list the externals commands you just added on the right. But the strange part is that the externals tools you setup will not be listed with the name you set them up with but with just general names like “External Command 2” & “External Command 3” etc. The correct names will not show up until you drag the tools from the dialog and drop them into one of your Visual Studio toolbars. Weird… but it works. I had a new toolbar setup for these two buttons and dropped them on to there. So, I am happily building and deploying my projects with a single click from within Visual Studio.